Brønnøy Kalk AS extracts approximately 2 million tonnes of calcite marble every year. The calcite marble is shipped from Velfjord to Omya Hustadmarmor’s processing plant in Elnesvågen. The raw material is processed into Hydrocarb M and is used as fillers and coating in the paper industry. The calcite marble from Velfjord is used by more than 100 million people in Europe each day in the form of magazines, books, cardboard packaging, etc. 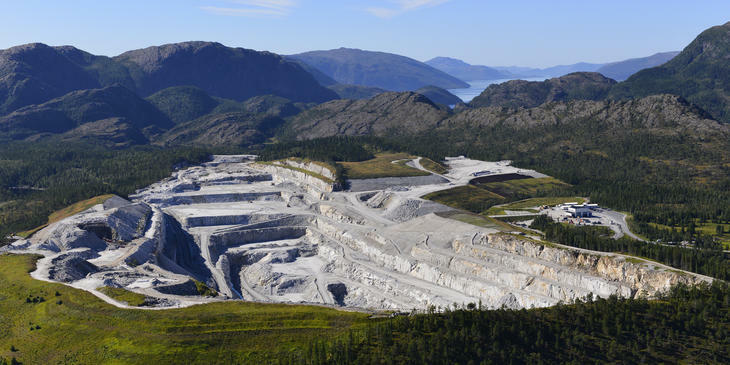 The use of Hydrocarb M in paper increases the quality and reduces the paper mills’ need for electricity and chemicals, thereby the calcite marble from Velfjord makes an important environmental contribution. The extraction of calcite marble from Akselberg open pit mine in Velfjord started in 1997. Brønnøy Kalk is a key enterprise for the economy of the region.